^ Lukes, Igor (1996-05-23). 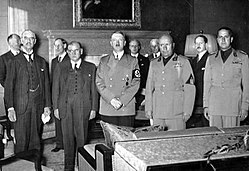 Czechoslovakia between Stalin and Hitler: The Diplomacy of Edvard Beneš in the 1930s. ISBN 9780199762057. ^ Snodgrass, Mary Ellen (2015-06-08). The Encyclopedia of World Ballet. Rowman & Littlefield. ISBN 978-1-4422-4526-6. ^ "The Voice of Russia ( PICTORIAL ART DURING THE GREAT PATRIOTIC WAR [ Exhibition 5. WW II: The Chronicle of Stone] )". web.archive.org. 22 March 2001. Archived from the original on March 22, 2001. ^ a b "The Expulsion of the 'German' Communities from Eastern Europe at the End of the Second World War" (PDF) (EUI Working Paper HEC) (2004/1). Steffen Prauser and Arfon Rees, ed. Italy: European University Institute, Florence: Department of History and Civilization. December 2004. Retrieved January 31, 2019.